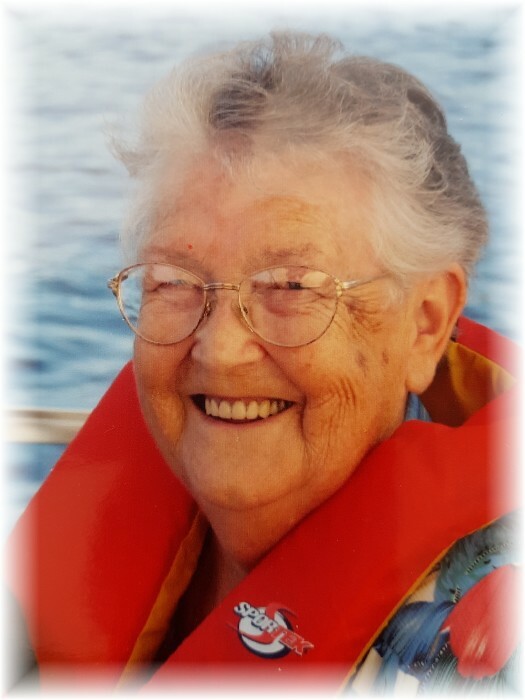 Obituary for Florence Oleksiewicz | Grays Funeral Chapel LTD.
With heavy hearts, the family announces her passing at the age of 85 years on January 28, 2019. Florence was born on September 14, 1933, to Owen and Pearl Brown, she was the middle child of 8 (7 girls, 1 boy), raised primarily in Eldred, SK, but as her father worked for CN Rail they also lived in other communities along the railroad. Florence taught school in Winter Lake, SK for a while where she met and married Ralph Isbister and raised 6 sons. She worked at the Prince Albert Training School for a number of years. One night at a Minus One Dance, Florence met Steve Olekiewicz and they were married soon after. They have spent the last 39 years together and lived on the farm in Porcupine Plain. Later they moved to Kinistino, then back to Prince Albert 7 years ago to be closer to her sons. To Florence “Family means everything”, this included not just her own sons but her siblings, nieces, nephews, and all the grandchildren and great-grandchildren. She enjoyed dances, old-time music, crafts, volunteering, but she loved family get-togethers most of all. She played cards and board games every chance she got. She was active in the Century Club in Kinistino where she made many good friends. Florence was blessed to have been a kidney donor-recipient which gave her over 20 years of good health, and she was very thankful for that. Florence will forever be missed by her husband Steve, sons: Wes (Karen) and their children: Scott (Allison), their children: Sloane and Raine. Jennifer (Tyler). Ivan, Kevin (Taryl) their children: Nolan and Caleb. Kerry and her children: Riley and Crystyn; Shelby. Harold (Lezlie) and their children: Shawn (Ashley) their children: Cameron, Braxton, and Huxley. Blair (Robyn) their children: Lincoln and Eldon. Brittany (Jeff) their children: Charlie and Jaxon. Ron (Sharon) and their children: Amy her child: Regan. Shania. Harley (Darlene) and their children Dustin and son Mason, Jordan (Candice) their children Lucy, Luca. Kellen. Eric and his son Dawson. siblings: Muriel Gulldager, Myrna Baird, numerous nieces, nephews, relatives, and friends. Florence was predeceased by 2 sons in infancy: Clifford and Melvin, siblings: Ellen Baird, Cora Laroque, Dorothy Olsen, Shirley Walsh, Mervin Brown. Memorial Service will be held on Friday, February 1, 2019, at 11:00 a.m. at Gray’s Funeral Chapel, 575 – 28th St W, Prince Albert, SK.